I crocheted one of the Lion Brand Gecko bookmarks. It was cute, but yikes the 14 ends to weave in freaked me out. I decided there had to be a way to design one that had way fewer ends. Here is my version of the gecko. Only two ends to weave in. Also what I think is a better shaped head. AND did I mention only 2 ends? Thanks to Virginia for testing this pattern. Chain 55. Place a marker in the 21st chain from start of ch. TAIL: 2 single crochet in the 2nd ch from hook, 2 sc each of next 10 chains (to create corkscrew effect); single crochet in each remaining chain (22) to the marker. Remove marker. Slip stitch in ch where the marker was, half double crochet in next ch, double crochet in next 4 ch. Leg 1: Ch 10, dc in 2nd chain from hook, slip stitch in each of next 2 chs (1st toe); *ch 4, dc in 2nd ch from hook, slipstitch in each of next 2 chs** (2nd toe); repeat from * to ** for 3rd toe. Slipstitch in the 6th ch of the ch 10 (first ch by the first toe), slipstitch innext ch, sc in 4 chs. Slipstitch in side of the dc at the base of the leg. Pull the slipstitch tight. Leg 2: Ch 10, dc in 2nd chain from hook, slip stitch in each of next 2 chs (1st toe); *ch 4, dc in 2nd ch from hook, slipstitch in each of next 2 chs** (2nd toe); repeat from * to ** for 3rd toe. Slipstitch in the 6th ch of the ch 10 (first ch by the first toe), slipstitch innext ch, sc in 4 chs. Slipstitch in side of the dc at the base of the leg. Pull the slipstitch tight. Head: Dc in 1 st, hdc in 1 st, 2 dc dec over next 4 sts. Hdc in 1 st, slipstitch in last ch, ch 1. Working in the unused loop of starting ch and over the tail. Slipstitch in same st as last slipstitch. Hdc in next st, 2 dc dec over next 4 sts. Hdc in next st, dc in 2 sts. Leg 3: Ch 10, dc in 2nd chain from hook, slip stitch in each of next 2 chs (1st toe); *ch 4, dc in 2nd ch from hook, slipstitch in each of next 2 chs** (2nd toe); repeat from * to ** for 3rd toe. Slipstitch in the 6th ch of the ch 10 (first ch by the first toe), slipstitch innext ch, sc in 4 chs. Slipstitch in side of the dc at the base of the leg. Pull the slipstitch tight. Leg 4: Ch 10, dc in 2nd chain from hook, slip stitch in each of next 2 chs (1st toe); *ch 4, dc in 2nd ch from hook, slipstitch in each of next 2 chs** (2nd toe); repeat from * to ** for 3rd toe. Slipstitch in the 6th ch of the ch 10 (first ch by the first toe), slipstitch innext ch, sc in 4 chs. Slipstitch in side of the dc at the base of the leg. Pull the slipstitch tight. Dc in 3 chs, hdc in next ch, slipstitch in last ch..
With the remaining tail, weave through the back of the sts to the 3rd st from front legs. Sew across to the corresponding st on other side of neck. Weave in end. With yarn needle pull red yarn through the st under the point of the Gecko’s head. Glue in place. I used a plastic clothespin to hold the red yarn together close to the head, just the yarn not the head. Don’t use a wooden clothespin, ask me how I know. To heck with making this for a kid... I want one! Very cute! You could also make a neat bookmark by making the tail longer. That would be so neat for hard-to-make-for boys. The tail is aready plenty long for a bookmark. Try one you will see for yourself. He's absolutely gorgeous. I'm going to print off the pattern and go curl up with a cuppa and make some right now! Wow - thank you so much for this! I too made the Lion Brand one but the ends - oy! :-) This is adorable! Even my hubbie wants one. I hate weaving in ends and try to figure out a way to crochet objects with as few ends as possible. Can you help me out?? I'm dutch, so not so familiar with englisch crochet terms. I figured the tail and legs out, and they are great!! But I'm having trouble with the head. It sais 1st so many times.. don't know how I should interpet it. 1 st, means one stitch. 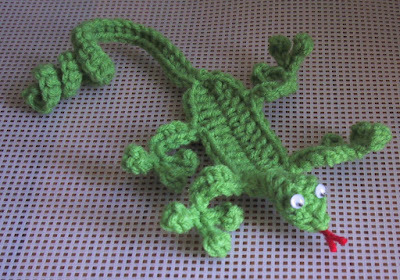 c'est sympa un lezard en crochet je n'avais jamais vu bravo.. I don't speak French, but from the Spanish I took lo those 50+ years ago I think this was complementary. I made one for my granddaughter. Her science teacher saw it and loved it. Had to make her one too. Said it was so cute she was really tempted to learn to crochet to make them. Maybe you will have a student. Sorry I don't do video instructions. Love this. I am sewing him onto a scarf I knitted. What a terrific idea to use it as an embellishment. I make caps to donate and boys would love that. This pattern saved my life. I am crocheting 40 bookmarks for the kids which I work with in 2nd grade as a holiday gift. Our school mascot is a gecko. I was stressing out as I tried the Lion brand pattern and there was definitely way to many ends!!! I almost gave up until I found your pattern. This pattern is way to adorable and the best part is that is really easy!! Thank you so very much for creating it, You are going to make a lot of second graders happy!!! It pleases me to think of the 2nd graders receiving the gecko. I love this pattwrn, but i know i changed it somehow, around the head so mine came out different, don't know what i did. However, i now have 9 orders for them be ause they are still cute. Crocheted my tongue and darned the eyes, i just wish i could figure out how to post a pic so you could see it. Just what I was looking for, THANKS!! Doing it up in Camo color yarn and will darn the eyes. the pattern went well until the head instruction, I figured out after sleeping on it, with the remaining chains that are left, put the 1DC in the chain closest to the already worked body, put the HDC in the next chain stitch and so on until you come to the chain(loop)that was made, that began the project, work the stitches down the other side of those stitches, continue to make the 3rd leg and so on. The pattern totally confused me at the head. Tried to figure it out over & over but the back part comes out off centered. That part of instructions is really confusing.